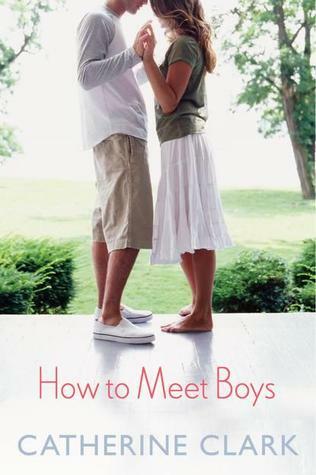 How to Meet Boys is a lighthearted book that deals with friendships, relationships, and growing up. This is a topic that can be done really well, but for me, How to Meet Boys felt a little flat. The characters were flat, even confusing at times, and the relationships weren’t that interesting either. Lucy and Mikayla are staying at a cabin owned by Lucy’s grandparents for the summer. Lucy is working at her grandparents’ apple store with Jackson, the boy who embarrassed her in 8th grade. Mikayla is working at the local country club. She’s never met Jackson and never seen a picture of him. So when they meet, Mikayla doesn’t know who he is. What follows is a lot of teen dramatics, confusion, and frustration. The character never really felt flushed out to me. Lucy can’t seem to get a grasp of what her personality was. Mikayla was said to be shy had have trouble talking to boys, but that was never clearly shown. Ava seemed like she was thrown in there to serve as mediator, but she didn’t really fit that role. Lucy’s mother showed up and was a crazed spazz and that didn’t seem to have a purpose. I don’t think any of this would have been a problem if the story had been more worked out and these characters had served a purpose. Instead, they felt like they were filling personality roles, not being people. The story didn’t draw me in, either. It felt like Clark was trying to make it more dramatic that necessary. Yes, teens tend to do that at times, but it didn’t feel like there was a point other than to make it dramatic. Then there was the situation with Lucy’s mother. Having a parent come to check in on two teens staying by themselves in a cabin for the summer makes sense. But that’s not what Lucy’s mother did. This is all looking past the problems I had with Lucy and Mikayla’s parents agreeing to let them stay unsupervised for a summer. I was a good kid in high school and didn’t really give my parents problems, but there is no way they would have let me stay with a friend in an adult-less cabin. In the end, How to Meet Boys was not the book for me. There will be people who enjoy it, but I’m not one of those people. The characters didn’t feel fleshed out and the plot didn’t draw me in. It’s not a bad book; it’s just not my style. This entry was posted in Contemporary, Young (and New) Adult and tagged Catherine Clark, Contemporary, Young Adult.